So my mom's car has a couple codes and im having a hard time figuring them out. First it started with a rusted cat flange, i cut and pieced that in and everything was good for awhile until it got a p0420 code and more rusted exhaust so i replaced the cat with a magnaflow one as well as the resonator to the muffler. Again everything was fine for awhile then the code came back along with p0497 and p0498. The p0497 went away on its own, i replaced the upsteam o2 sensor, no change. The downstream o2 sensor is so tight i broke my nice matco o2 sensor flexhead extended handle tool trying to get it out. I then checked the resistance on the canister vent shut valve and that came back at 26Ω which im pretty sure is within spec. I then checked for continuity from the connector at the cvsv that goes to another connector at the other side of the canister and both the light grn wire w a red tracer and i believe blue wire with a white tracer both have continuity. The leads for my meter arent long enough to check for continuity from the ecu to the connector at the canister, and im not really very good with electrical or multimeters to know what else/how else to check lol. Last edited by Justin Vaughn; 04-15-2018 at 08:33 AM. I also check the white c501 (i think) connector next to the data link connector. I didnt see any tell tail signs of anythings wrong. Of course i cant be fortune enough to have the common problems like that connector, bad shut valve, or a bad fuse that throws the p0135 code as well. When it comes to my luck, its usually always something thats more of a P.I.T.A than usual lol. What are all of the codes currently being thrown? Sometimes things might be related even through they seem to be for totally different systems. At first i was focused on the p0420, then when that wouldn't go away again after the replacement of the cat, more rusted exhaust, the upstream o2, then breaking my o2 sensor tool on the downstream (which was my main concern after the cat) , i turned my focus to the p0498 hoping that would be an easier one to solve, or hopefully solve both after seeing the cvsv and a/f sensor are on the same circuit/share the same relay, but as you can see from all the testing and checking ive done, its be quite the pain in the @$$ as well lol. Here are a couple of tests, report your findings. 1. Disconnect the 2P connector to the canister vent shut valve (CVSV). Measure the voltage at terminal no. 2 (Blu/Wht wire). Multi-meter red lead touching terminal no. 2 and black lead touching body ground. Is there battery voltage? Standard battery voltage is 12 volts. 2. If voltage measurement was okay in above test, connect the 2P connector back on the CVSV. At the PCM, Connector E (white 31P Connector), backprobe terminal no. 19 (Lt Grn/Red wire) to measure voltage. Is there battery voltage? Backprobing is either using a backprobe set or using a thin needle or something and making contact with the metal terminal of the connector without piercing the wire in the back of the still connected connector. Care must be taken to ensure that the wiring does not get damaged. You can use something like a T pin, available at Walmrt, etc., and backprobe. These pictures are just to give a picture of the concept of backprobing without piercing any wires. Awesome. Thank you for your reply and advice. I am familiar with backprobing. I have done it a couple times previously. 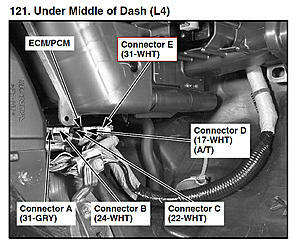 See attached photo for Connector E and pin out for terminal no. 19. Oh ok im sorry i mistaken the E for a B. It was late and i didn't have my glasses on lol. I jus got home from work and its a miserable rainy mess today here in boston ma. Crazy how many ppl are running and watching the marathon in this weather. As soon as i get some decent weather ill be sure to check and report. I assumed the grn/red wire was the ground by the wiring diagram i found, so checking that for voltage at the cvsv, is that checking for a short to power? Or is that a power circuit? If checking the blue/white wire for voltage at the ecu, shouldn't that have voltage at the cvsv? Not that im doubting or questioning you, i seen a lot of you're posts while i was searching before posting and its obvious you know what you are talking about (i was actually hoping and looking forward to you replying to my thread lol), Im just trying to get a little better understanding of electrical and how this circuit works. On the diagram i seen, i believe it said blue/white is always hot. So with the key on would that be checking it under load for voltage drop? Last edited by Justin Vaughn; 04-16-2018 at 03:11 PM. The troubleshooting for you P0498 is frustrating, because it doesn't tell you what is power and ground. It looks like E19 (light green/red) is the ground, but the manual is vague. The quickest way to determine the power and ground is unplug the canister shut valve. Inspect the connector for corrosion on the terminals. Use your volt meter grounded to clean metal on something like the exhaust. Use the volt meter to determine which pin has power. To test the power side of the circuit under load, use a test light on the power pin and use the same bare metal as your grounding point. Test that the power pin can supply enough current to turn on your test light. The resistance test you did on the shut valve is a good test to determine open/closed circuit. Your volt meter uses a low current for the resistance test. Your shut valve may have higher resistance when high current runs through it, so it still can be bad shut valve. I only skimmed through part of your post, as i just got off work and a little tired; so, I may miss something in my reply. The Blu/Wht wire is hot only when the Air/Fuel Ratio Relay contacts are closed, which allows power (+) through from under-dash Fuse No. 4. In my previous post regarding the test, the car is not started or running. You would merely be turning the ignition switch to the ON (II) position. 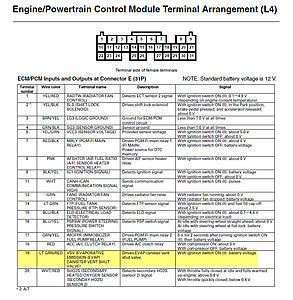 When the car is not running, the enable conditions are not met, so the PCM/ECM would not send a ground to the CVSV. Therefore, voltage will be allowed through the coil, and there should be battery voltage reading at Connector E, terminal no. 19 of the PCM/ECM. Attached is an image of the expected signal for your model year car at terminal no. 19. The tests I wrote up would essentially test/measure for continuity and voltage. 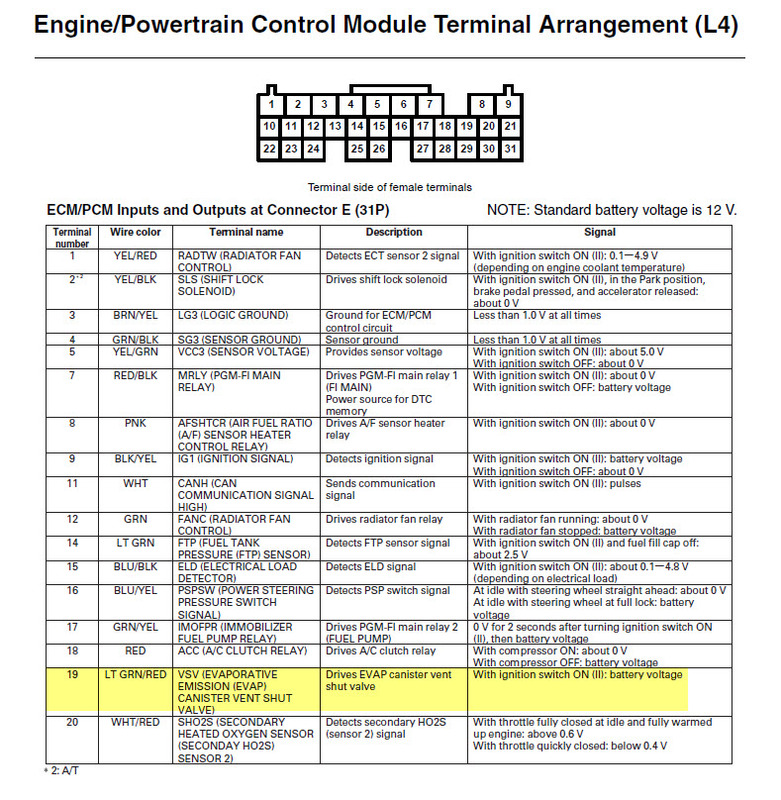 These two following links are descriptions related to later model Hondas; but, may include additional insight into the system for how P0498 is set. Last edited by redbull-1; 04-17-2018 at 09:16 AM. Reason: Correct some info.